Ballet Arizona is excited to announce the Hazel Hare Award of Artistic Excellence. Established this year, it is awarded to a male and female dancer whose spirit echoes the strength, dedication, and passion that Hazel exemplified throughout her entire life. Hazel was a strong, dedicated woman with a deep passion for the ballet. 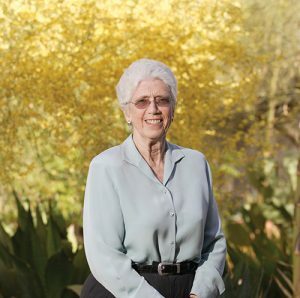 A generous supporter since 1996, she arranged to make a transformational gift to Ballet Arizona through her estate, the Hazel A.S. Hare Charitable Trust, establishing an endowment of more than $4 million. The largest, single gift in Ballet Arizona’s history, the endowment will help to fund the artistry she so deeply loved. 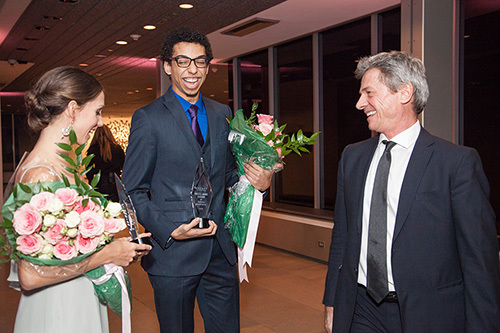 Award winners Jillian Barrell and Ethan Price with Artistic Director, Ib Andersen. Photo by Haute Photography. For the inaugural year, Artistic Director, Ib Andersen, presented awards to dancers Jillian Barrell and Ethan Price at Ballet Arizona’s annual Dance With Me Gala on January 19, 2018. Jillian Barrell joined Ballet Arizona in 2007 and has performed many leading roles over the years. Jillian originated the title role of Ib Andersen’s Cinderella, and her “youthful sparkle” was noted by the New York Times for her principle role in George Balanchine’s Divertimento No. 15. Upon awarding Jillian, Andersen said that she has been a big part of bringing Ballet Arizona to where it is today. Entering his second season, Ethan Price joined the company after training at the School of Ballet Arizona for eight years. Noted by Andersen for representing the future of the company, Ethan danced his first leading role, as Prince Siegfried, in Ballet Arizona’s production of Swan Lake last fall. Click here to see more photos from our 2018 Dance With Me Gala. What good fortune for Ballet Arizona to have received this Legacy gift from Hazel Hare. We are deeply grateful to her. And a heartfelt congratulations to Jillian and Ethan for being the first recipients of this prestigious award!